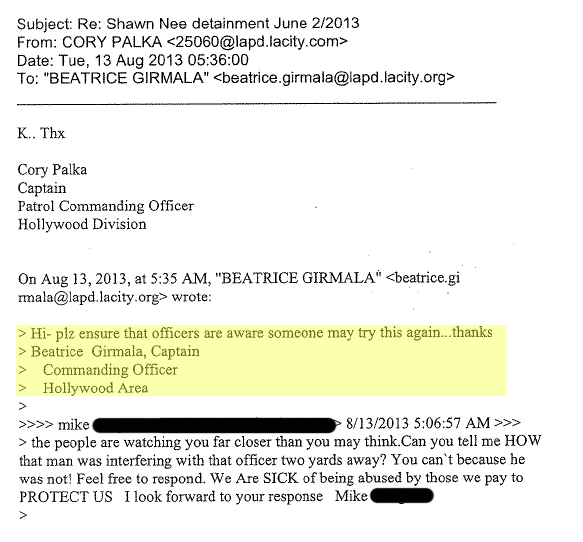 After reading Carlos Miller’s article yesterday regarding cops warning cops about citizens with cameras, it seemed relative to share a similar email from one of the Los Angeles Police Department’s Commanding Officers. But in order to get to that part of the timeline, I first need to clarify some things. 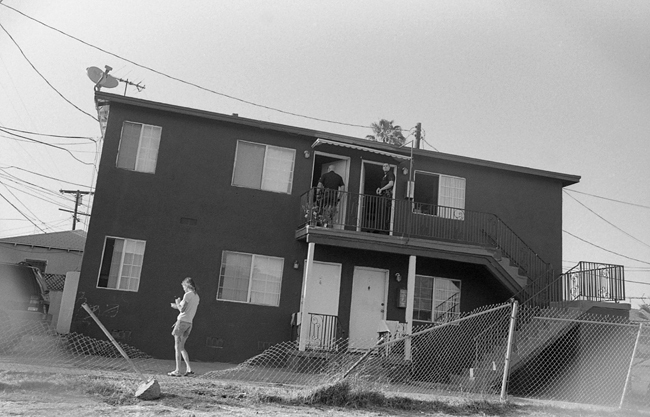 In June 2013, I was unlawfully arrested for photographing LAPD officers from a public street. The video was made public in August by Reason.com. 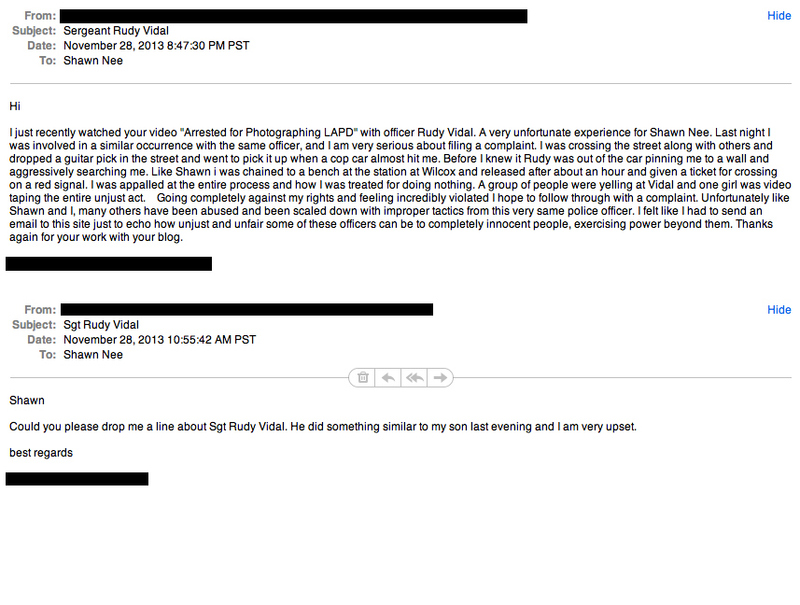 LAPD was contacted by various media outlets and started commenting on what happened to me (such as here). 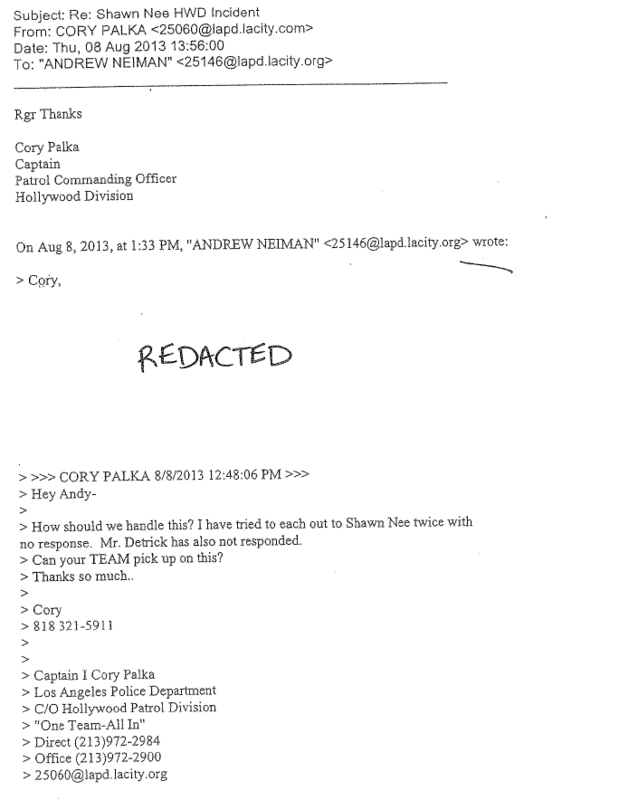 After reading what Lt. Andy Neiman was saying, I figured that the cogs were turning internally at LAPD—that the department was trying to get all their ducks in a row in order to justify handcuffing me to a bench for taking pictures in public. So instead of sitting back and doing nothing, I began making public records requests for email communications regarding “Shawn Nee”. So why redact or hide an email? What is it that you don’t want the public to see? Besides receiving Neiman’s communications, emails between Bea Girmala and Cory Palka were also turned over. For clarification purposes, Ms. Girmala is no longer the Captain III of Hollywood Division. I was told that she was demoted/moved/given a new position/title because of all the problems that had occurred in Hollywood during 2013. Try what again? Take pictures in public space? Photograph police? Videotape police making an illegal arrest? I don’t know, but Girmala’s email makes it seem like that I went out on June 2 to intentionally target police that day in order to capture their unlawful behavior on video. And that other people will now try to do what I supposedly did? I can’t speak for other people’s future actions, but LAPD’s theory on what I was doing the day I was arrested is so far from reality (a fact that is based on other things besides Girmala’s email). I also can’t say what Ms. Girmala meant in her email, but to me, her email makes it seem like that she’s more concerned about officers being caught on camera violating people’s rights and making unlawful arrests than she is with officers obeying the law and understanding constitutional rights. If I’m wrong, Ms. Girmala can contact me at any time and explain what she meant in her email. I’m sure the public would like clarification. There was nothing like that — at all. Hi- plz ensure that officers are educated about First Amendment rights and receive proper training regarding people photographing officers performing their duties. We can’t have something like this happen again. When our officers are caught behaving unlawfully, we lose credibility and the public’s trust. The same laws we enforce on members of the public, also apply to us. Over the next few weeks, I will be releasing various emails that I’ve obtained through my public records requests. Some of them are interesting and reveal a few things that the public doesn’t know about. So I’m glad to share them with the public. I will also finally release my Halloween videos, which include LAPD threatening me with arrest, violating their own policies numerous times, and an undercover officer intentionally committing battery on me. Actually, it was a cheap shot; the cop came up from behind and threw his shoulder into my back while I was taking pictures and not looking at him. One of the undercover officers there that night, was in the booking hallway when I was arrested (another officer called her Palmer; I’m guessing that’s her last name). She is not the cop who hit my body though. Besides all of that, I’ m gonna attempt to trace all of ISP addresses that visited my website since August. Any thing that I find out of the ordinary will be made public. So stay tuned, and I appreciate the support. As most of you already know, I was unlawfully arrested in June by the Los Angeles Police Department for taking pictures from a public sidewalk. Sergeant Rudy Vidal, who is included in the Christopher Commission’s ‘LAPD 44‘, ordered my arrest for interference. Last week I received an email from someone describing their recent encounter with Vidal. Apparently, “crossing on a red signal” is grounds for a trip to the police station and being chained to a bench. On June 2, 2013, while standing on a public sidewalk and approximately 90 ft. away, Shawn Nee was arrested for photographing officers from the Los Angeles Police Department. The officers claimed he interfered with their police investigation. Shawn was transported to the Hollywood police station, handcuffed to a bench, and escorted into an interrogation room where he was questioned by a detective. The arrest lasted approximately 1 1/2 to 2 hours. Shawn was eventually released without charge.